I don’t drink, but we have family members and friends who do. So I thought it would be nice to know how to mix some drinks for get togethers or parties, if we ever decided to do that. This book has all the information you need to make a wide variety of drinks and is very simple to follow. Each drink has graphs and charts showing the type of glass to use and how full to make the drink. There is also a chart that shows the percentage of ingredients. The titles for each drink are: ingredients, description, best occasion, proportions, time required, instructions and a photo of the finished drink. I think this book is awesome!! It takes the worry out of making a drink when you have no clue what you’re doing. It would be perfect for anyone who likes making drinks or someone who would like to learn. I haven’t used the book yet to make a drink, but wouldn’t be afraid to with this book at my side. It's nice to see it lists the calories in the drinks – you don't see that very often. I don't drink much now other than wine sometimes but I love to see how all those drinks with the fancy names are made. The calories being included is great. This sounds like a fun book for the Holidays — and it would probably be a great shower gift as well. Thanks for the review! What Col said! I'm going to have pick up a copy. Now this could save us a fortune; the cocktail bars here in Lanazarote charge about 8 euros each. Or perhaps I could set up on my own….. This would be a very handy book indeed. I'm putting it on my Christmas wish list. Thanks for the review. When I graduated college I had dreams of traveling the world working as a bartender so I went to bartending school. I decided to further my education so I never used my skills. 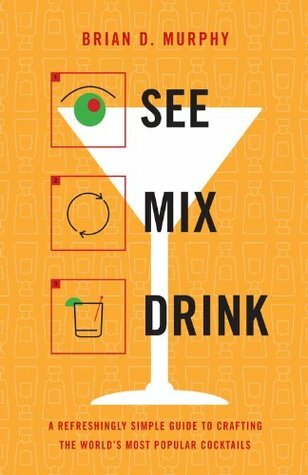 Unfortunately I can't remember how to make most of the drinks so this book would be a great refresher course. I love a mojito or margarita in the summer, but we mostly drink wine. Would love to know how to make those fancy cocktails though! Very interesting book, although I would probably never use it. Irish coffee is about the extent of drink mixing at our house. But it might make a nice Christmas gift for someone 🙂 Thanks for stopping by my Post! Maybe it's coming back into fashion? !